"I am an explorer of both technique and medium, constantly hungry to try something new. My work varies from functional, such as my wood and steel furniture, to whimsical, as in my colorful wall sculptures, to monumental in my large scale and public art pieces. And I still love to paint." 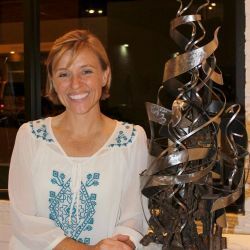 Amie J. Jacobsen is a multi-facetted artist and designer currently producing work in sculptures, artisan furniture, and painting. A lifelong artist, Amie began he career in painting and illustration, teaching for the Savannah College of Art and Design (SCAD) in the Foundations, Illustration, and e-Learing department from 2006-2015. During her time with SCAD, she authored 3 courses for the school’s e-learning program and illustrated 12 children’s books. In 2015, Amie took the opportunity to learn metalworking as the in-house designer and resident artist at Machine Head, a metal fabrication shop in the Crossroads Art District in Kansas City, MO. Amie moved into her own studio space in 2017, and now splits her time between Colorado Springs, CO and the Kansas City area where she maintains a studio and workshop.